Here in the United States, with politicians and pundits of all stripes yammering ad nauseum about each other’s shortcomings, and with our insatiable obsessions with media and celebrity, it’s easy to lose perspective about what’s important in the world. Despite the tolls taken by the recession, we Americans still live in a comfortable bubble marked by the personal freedoms of expression, consumption and, most fundamentally, democratic standards — liberties denied to millions of other people on the planet by oppressive governments, megalomaniac dictators and hard-fisted clerics. 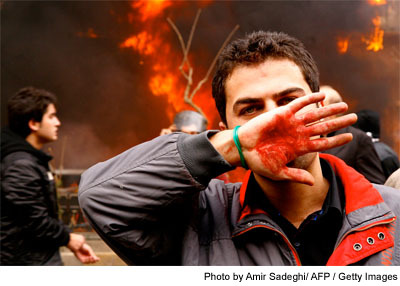 * Planet War: Foreign Policy editors put together a powerful photo essay on the 33 conflicts “raging around the world today,” reminding us that “it’s often innocent civilians who suffer the most.” Above, an Iranian dissident in December 2009. * Hell on a Small Island: Dirck Halstead writes about two photographers, Damon Winter of the New York Times and Shaul Schwarz of Reportage/Getty Images, who covered the horrific human disaster that followed the January 12 earthquake in Haiti. For them, says Halstead, “the camera becomes a shield, a protective layer between terrible death and the photographer.” Here is Winter’s gallery, and her is Schwarz’s gallery. This entry was posted in Grab Shots, Photojournalism and tagged Damon Winter, Digital Journalist, Dirck Halstead, Foreign Policy, Haiti, Iraq, Magnum, Peter van Agtmael, Photojournalism, planet war, Shaul Schwarz.